Thunderbirds are go. Welly Walks the Walk for Christchurch is set up! Either way, I'm putting in His hands. All I know is I couldn't do nothing. 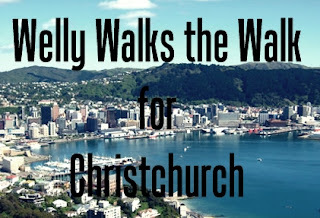 Walk with me fellow Welly dwellers. If you can't walk, tell others who can! Friends and family around the world, support the cause by making a donation here. Inspiration from Gail at Delightfully Diva-ish, so if you're in Auckland, you can get involved in that walk, details here. good on you!! Im sure you'll have heaps of walkers! Fabulous! Count me in! A part of me wonders how much sponsorship we'll actually raise - as so many people have already or are giving right now - but even so the act of walking and thinking and caring for the people of Christchurch speaks volumes in itself. Thanks so much for your support and willingness to be a part of it. I know what you mean about people already giving. I'm hoping we can capture some of those who mean to donate to a general fund but haven't quite gotten around to it so this is more in their face! And those friends and family overseas who would rather support the cause through someone they know doing something. Whether it's $100 Or $1000 it's still worth it!!!! Go girl! Love your heart, and the hearts of others getting behind this. I know these things are awful, more than awful, but I also know that, as with our Queensland floods etc, it brings out the best in humanity - all of a sudden we are united in cause, and hope... praying for you all! Saints Alive - that were good!